This deliciously light and creamy dessert is so simple to make, try sprinkled with hazelnuts and blueberries. Divide the compôte between 4 serving glasses. Put the cream, sugar and vanilla into a saucepan and bring slowly to the boil. Take gelatine sheets and place in a bowl of cold water to soften. Strain the gelatine with a fine sieve to remove any excess moisture. Take the cream off the heat and whisk in the gelatine. Allow the mixture to chill slightly before pouring it over the fruit compôte. 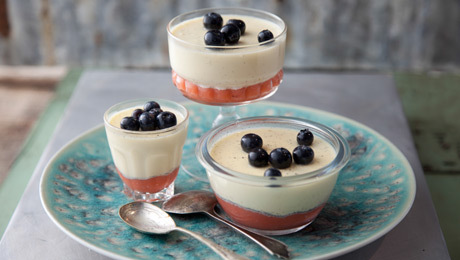 When pouring over the fruit, pour the unset Pannacotta over the back of a teaspoon to ensure the fruit compôte is not disturbed in the glass.